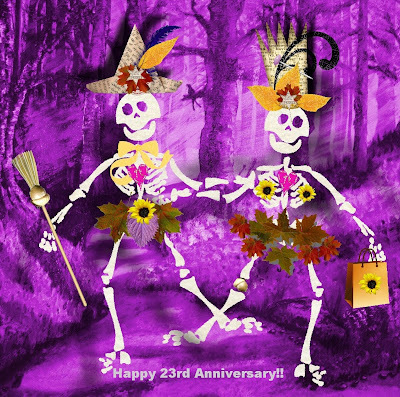 Today is our 23rd anniversary! Hard to believe we have lasted that long! Yet 1986 does seem so very far away. Here is a little digital scrap I did as part of the BlogArtist Scrap Train (see here). The entry says "If you would like to dress up for the trip, download our “little naked skeleton” and doll it up for lots of tricking or treating. Be sure and post your masterpiece in the ScrapArtist Flickr Group." However, you have to be a member to do so, and I am not. So I am sharing it here!